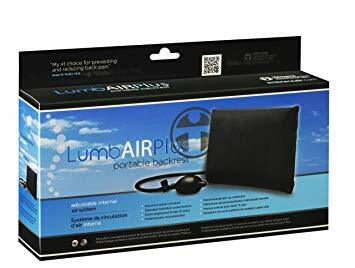 The Lumbair Plus is designed for those who want ideal low back support, this unit provides a gentle foam cushion that can be adjusted using the aspirator bulb. Ideal for small office chairs, bucket seats or where portability is required. The inflatable lumbar cushion is the perfect way to help relieve the discomfort and pain of prolonged sitting. The LumbAir is a lumbar support that also promotes ideal posture and posture changes. Take it with you to the office, in the car, even on your next flight. The LumbAir is made with exclusive fabric that is immune to bacteria, fungus and body odour. It is guaranteed for one year against defects in materials and workmanship. The valves are guaranteed for life. The foam is engineered to last 15 years. These products are flame retardant, exceeding California standards. Get the latest scientific evidence on back exercise - what helps and what hurts, and why. Ultimate Back Fitness and Performance provides the evidence base to design and prescribe the most appropriate exercise programs for the back. Professor McGill's unique approach is based upon years of scientific research into back function of injured people through to elite athletes. His expertise is sought by governments, corporations, professional sports teams and athletes worldwide. A complete description of a 5 stage program is provided. Examples are provided for each stage within a back pain rehabilitation program together with performance enhancement programs for athletes. Beginning with recognizing and re-patterning perturbed motor programs and progressing to the enhancement of stability/mobility, then endurance, the final stages continue with strength, power and agility training. Each step is well illustrated and instructive. Added to this are general approaches to assess the demands of individual activities and sports and how to identify the critical components that need specific focus in an individual's back. Dr McGill's style makes for an easy read of this thorough and rich resource. Be prepared for a new approach. Ultimate Back Fitness and Performance is a myth buster! Transition training guidelines are described and the concept of “superstiffness” is introduced with new exercises based on his recent studies. Tips to employ this effective principle are also described with examples – eliminate energy leaks, conquer sticking points, enhance speed and achieve ultimate performance. Practical sections include the "squat clinic". Typical of Dr McGill's writings, the guidance is evidence-based. Note - This book is intended to assist in the design of a wider spectrum of the best exercise progression to enhance back fitness in the safest way. It was written for savvy lay people and professionals alike. In an age where a seemingly endless amount of gimmicky back products are in circulation, a definitive guide to self-assessment and rehabilitation is more essential than ever. Back Mechanic guides you through a self-assessment of your pain triggers, then shows you how to avoid these roadblocks to recovery. Then effective exercises are coached in a step by step progressive plan. Spine expert, Prof. McGill used his 30 years of research findings and clinical investigations to create this evidence-based guide that has helped thousands reclaim their lives. This knowledge is now available to you in this richly illustrated book. You will become your own best Back Mechanic and advocate. This book is about healing injury in the athletes back and then building resilience to compete once again. Anyone who trains will enhance their injury resilience and performance employing these principles proven over and over with athletes. In the highly competitive world of strength athletics, a back injury is seen by many as the ultimate career-ender. In truth, if handled properly, it is far from a death sentence. Follow the journey of international powerlifting champion Brian Carroll, who can attest to this first hand. This remarkable athlete went from 1100 lb squats and 800 lb deadlifts to unending pain and disability after a massive spinal compression injury. After a fortuitous meeting with leading back expert Professor Stuart McGill, he reset his training and his life to fight his way back to the top of the winner’s podium. Glean expertise from McGill and Carroll, both masters in their field, and learn how to orchestrate your own triumphant comeback. 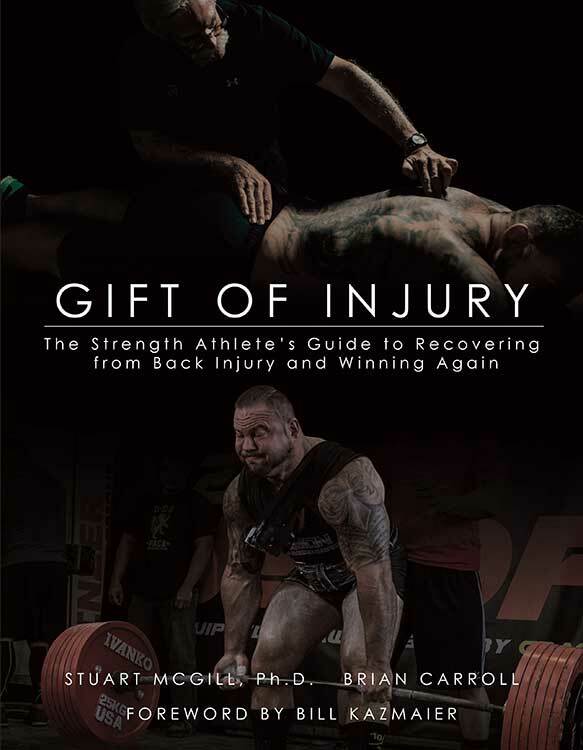 Whether you are a former champion yourself who has fallen on hard times, or someone starting a new foray into the world of strength training who wants to avoid injury and maximize training, the wisdom found within these pages is sure to take your resilience and lifts to the next level. Over 200 full colour, rich illustrations demonstrate technique.